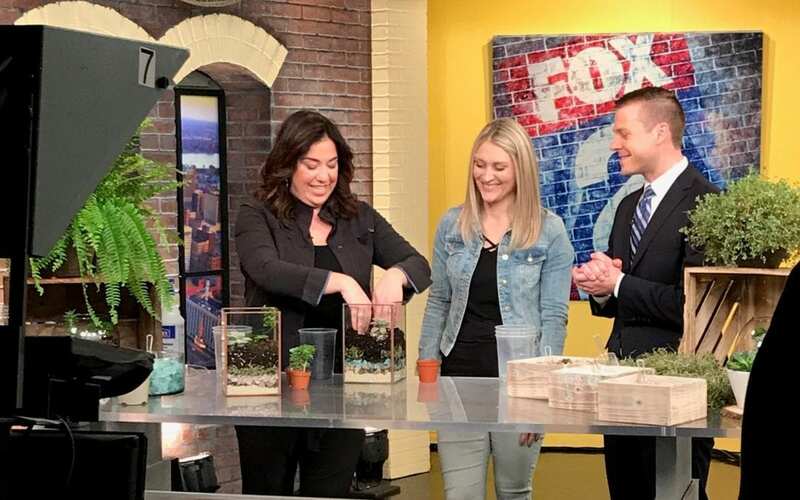 Kendall Goddard and Jen House, co-owners of Jen House Design, appeared on Fox 2 News on Monday, April 15, to show viewers how to create DIY terrariums just in time for Earth Day. Need a little help? 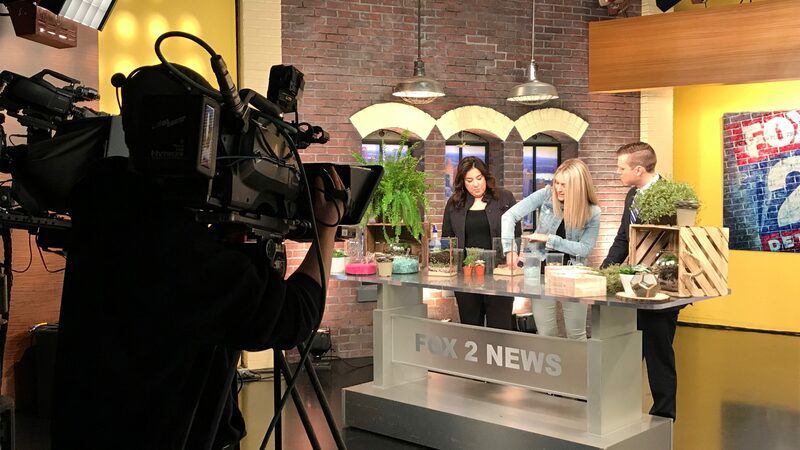 Jen and Kendall will be hosting two terrarium workshops on Thursday, April 18 at Tribe Detroit in Warren. Tickets are still available. In the cylinder containers or small buckets, put out the soil, sand, colored rocks, and pebbles along with scoops for each. Set out the small or medium containers, and succulents and air plants as well. Provide guests with containers for their terrariums. Layer sand, pebbles and soil then “plant” the succulent or air plant. Spritz terrarium with water weekly. Succulents like plenty of indirect light. Never put in direct sunshine or outside. They do well on a window that gets only indirect light all day. Too much direct sunlight will burn the plants as the terrarium can get very warm. Succulent terrariums do require watering. You can spray with a light mist every week. Let soil dry out between waterings. Slightly increase watering amount when weather becomes hotter or drier and slightly decrease when cooler. If you notice the leaves shriveling, it may require more water. Succulents require little maintenance. To discourage rot, it’s best to remove fallen leaves from the terrarium. It is also good to allow the terrarium to receive fresh air from an open window when possible. You may find that small black flies appear. Pyrethrum (low toxic insect spray) can be purchased from most supermarkets. A few sprays will bring these pests under control. Brown Leaf: often indicates dehydration or too much sun. Yellowing or Dropping Leaves: your terrarium is getting too much water.